The North Shore is known for more sun and less snow. Most North Shore lakefronts are on 1/4 to 1/3rd acre lots, but there are also acreage properties such as those located on Flick Point near Carnelian Bay and also some areas of Brockway near Kings Beach. There are more commercial services on the North Shore at Tahoe City, Carnelian Bay and Kings Beach. Tahoe Boat Harbor at Tahoe City is the largest marina on the North and West Shores of Lake Tahoe. 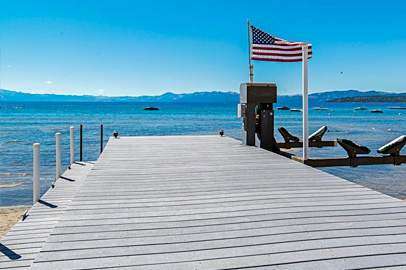 At Carnelian Bay there is Sierra Boat Harbor which hosts the Concours d’ Elegance Boat Show every August. This is a true marvel to attend to see some of the finest wooden boats in the world. Resorts on the North Shore include Garwoods at Carnelian Bay and the Boatworks Mall at Tahoe City. While the North Shore is considered to be very desirable, lakefronts on this side of the Tahoe tend to be more affordable compared to the West Shore. One advantage the North Shore has is close proximity to Tahoe Cross Country Ski area, which is also a mountain bike park with an extensive trail system all the way to Truckee. Depending on lot size, lakefront feet, pier or no pier, age, size, and other amenities, you will find a wide range of lakefront prices. As experienced long time Realtors here at Lake Tahoe we can explain the differences and help you find the perfect Lake Tahoe lakefront home to match your needs.